Now that I’m in my mid 50’s I react to Bruce Timm’s youthful reluctance to hire his heroes from the vantage point of having experienced age discrimination myself. (Or not--- people don’t tell you why they don’t hire you.) However, the question of “teachablity” remains: does being older mean one is no longer willing or able to learn and grow? 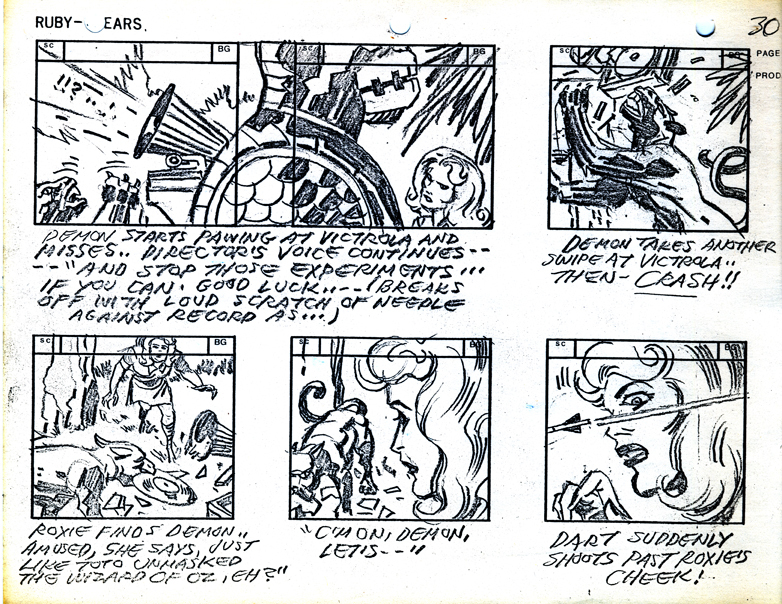 I fantasize about asking Kirby if he wanted to learn how to do actual production storyboards for animation, not just do inspirational pseudo-boards. I’m of two minds on this. 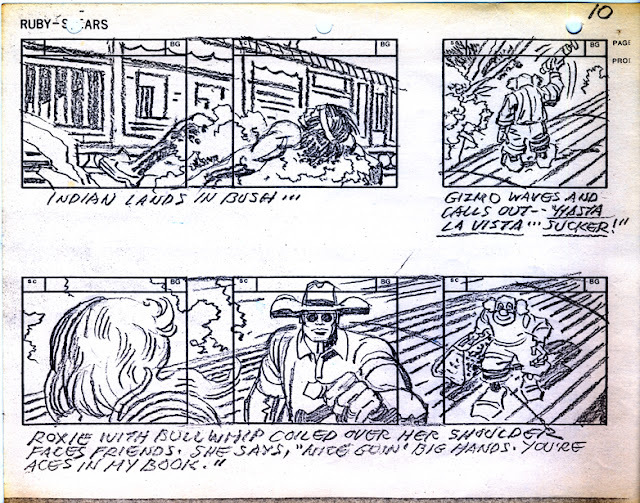 On one hand, comics storyboards are similar but not the same, and many a comic book artist has foundered on the shoals of the animation industry without knowing why. Drawing for animation is a particular skill, requires a particular mind-set. One needs to be able to draw attractive, compelling still images that are also part of a sequence that, when looked at 24 times per second, depict movement. 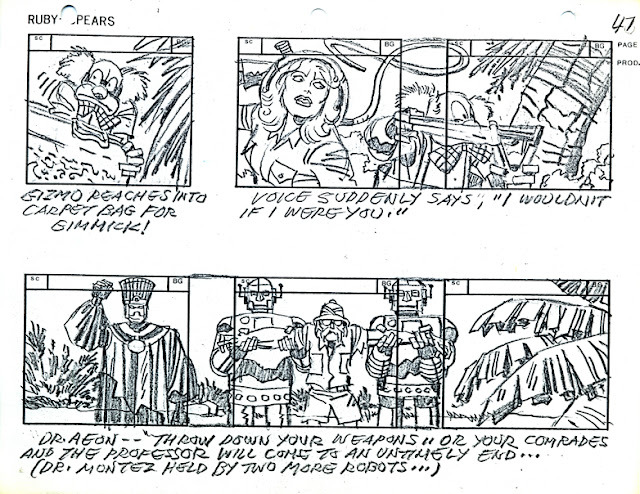 Storyboarding panels are like snapshots of a future movie, not illustrations in themselves. 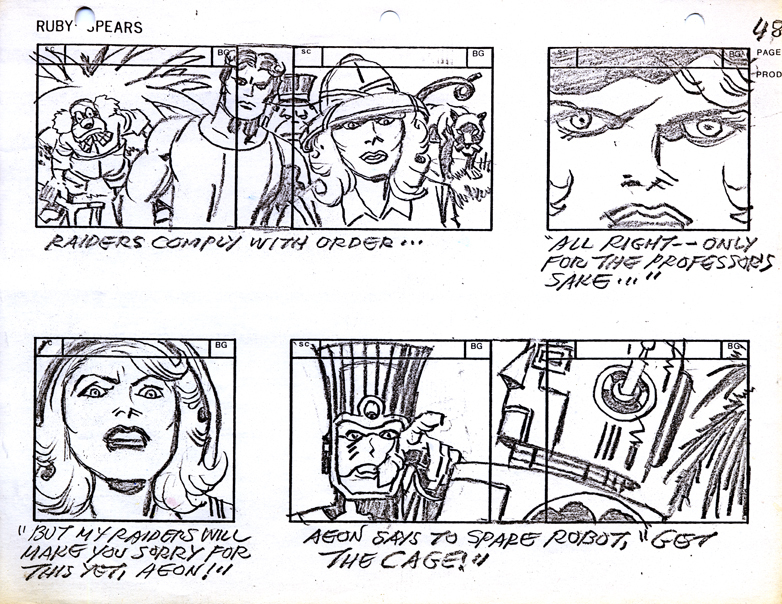 Unlike comics, left-to-right eye read isn’t normally a consideration, unless one is holding for several seconds on a motionless establishing shot (if there is any movement, the eye will go immediately to that.) 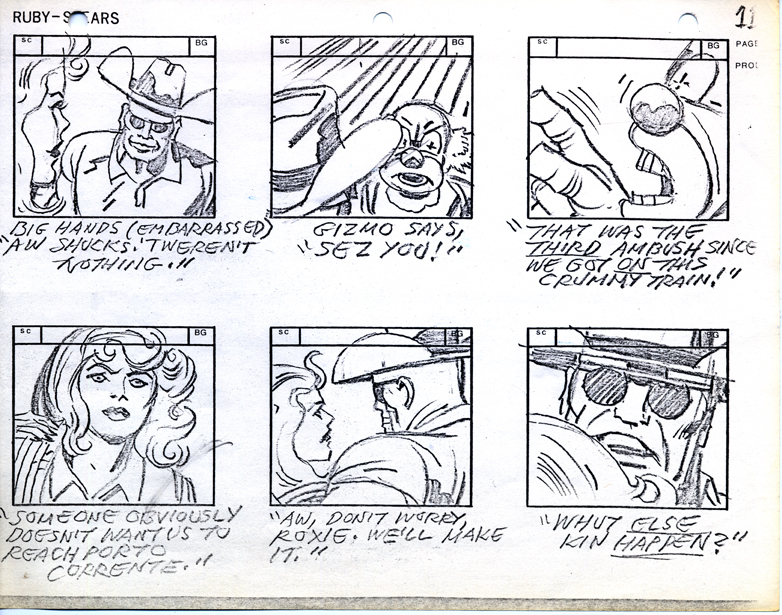 As seen in these samples, Kirby continually makes the mistake of taking 2 or 3 panels, the format of a pan, and treating them as a single image. Would there have been any gain by pointing this out to Jack? 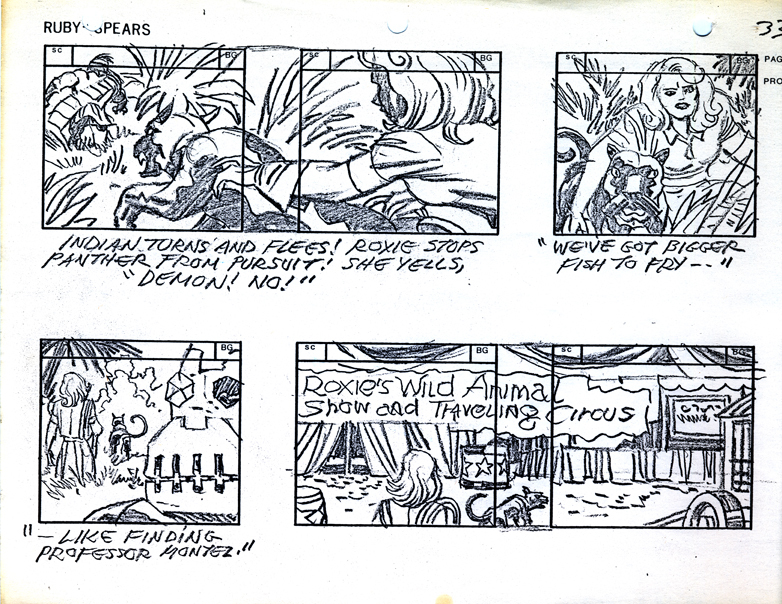 Did John Dorman try, or did he just sit back and enjoy the bravura spontaneity of the drawing and storytelling? 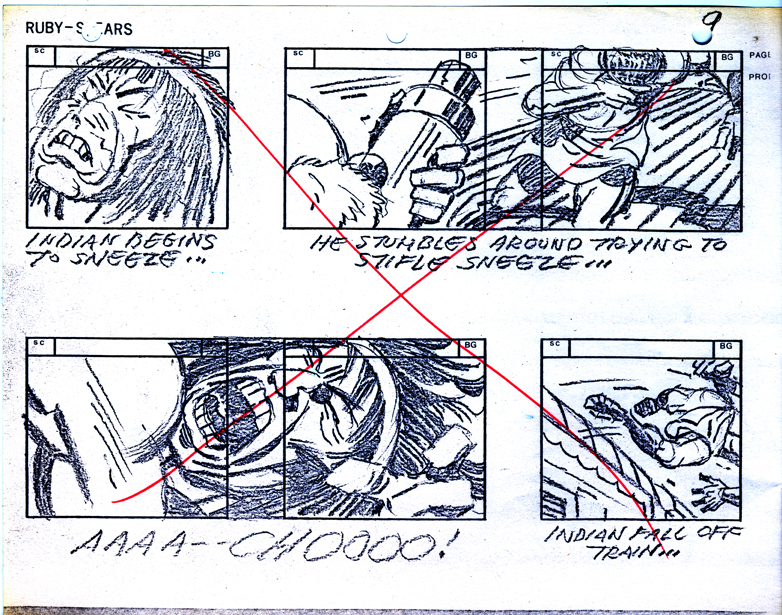 It’s possible that, if approached correctly, Kirby might have gotten it. Storyboarding for animation is its own special art form, and, if you get in the grove, can be extremely satisfying on its own terms, even apart from its utility as the template for a future film (but the second aspect is primary). 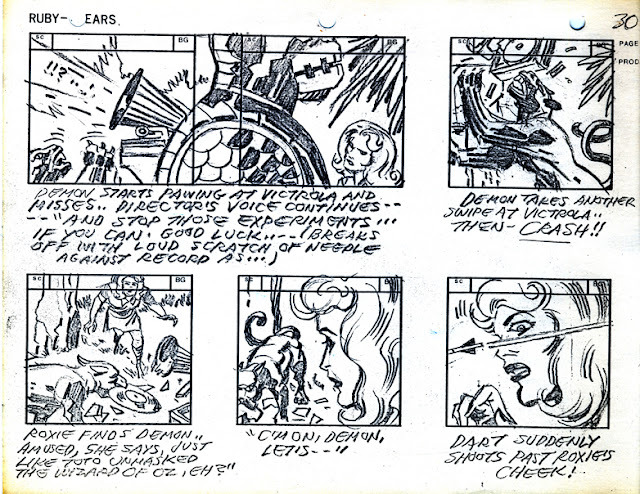 Studying one’s favorite movies and figuring out how to replicate or expand on their effects or even coming up with new filmic ideas, especially in a production environment of likeminded peers, can be a heady experience, and Kirby might have really taken to it. 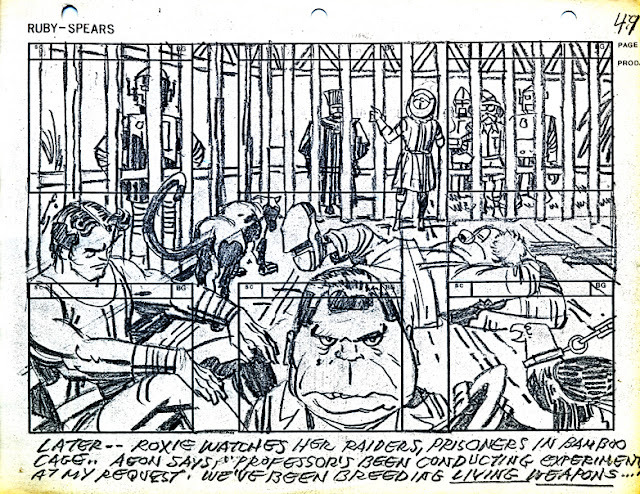 On the other hand, Kirby was an idea man above all else, and it probably would have been a waste of time to have him toiling in the day-to-day nuts and bolts. His was the grand vision, not the particulars. 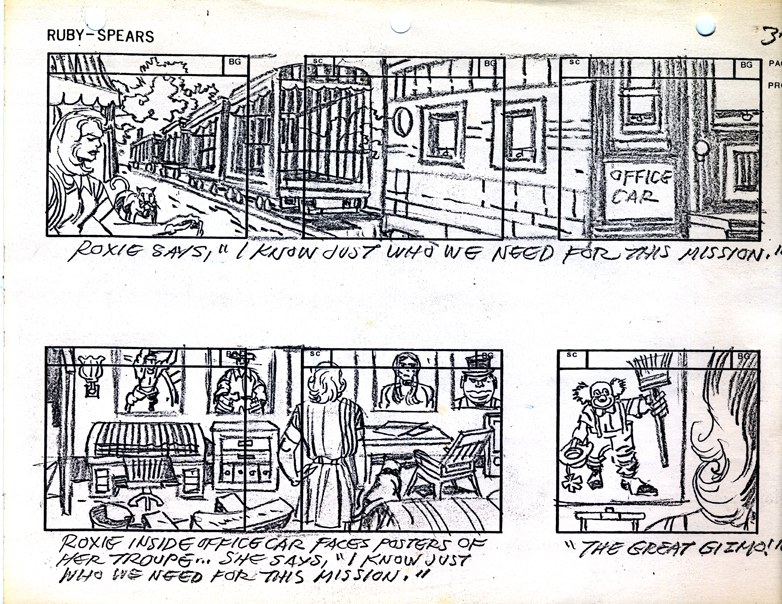 It may have been that John Dorman (assuming he was in charge in this regard) was exactly right in setting up things as they were at Ruby-Spears. 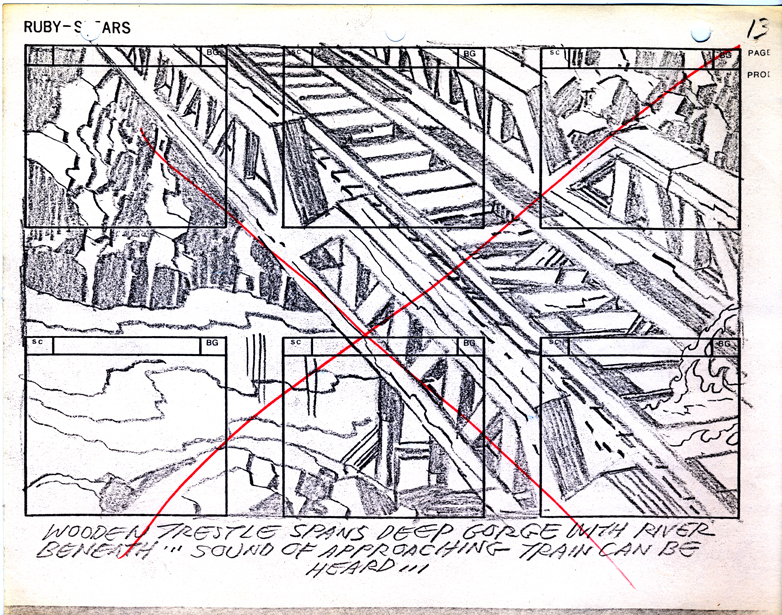 In my career as a storyboard artist and director of animation, I have often been assigned the task of supervising or correcting other artist’s storyboards, “making them work” as it were. 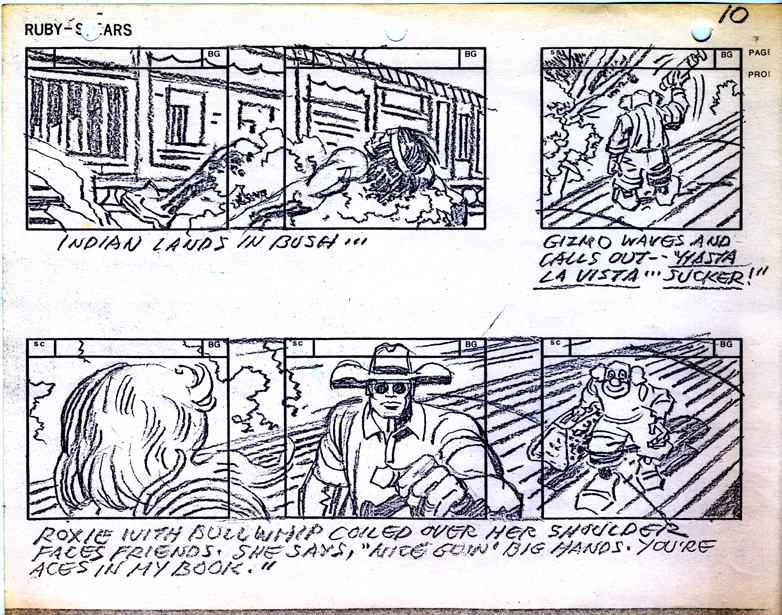 If I were give THIS storyboard to “fix” (sacrilegious as that thought is), the first task would be to re-size every single panel so that it fit within the aspect ratio of the panel, or, which would be easier, simply erase or white out the art spilling upward into the SC and BG number lines, followed by an admonish to the artist to stay within the panel boarders. Then I’d tell the artist to add backgrounds; even if the backgrounds are out of focus, one needs to be out of focus on SOMETHING. One can call out color card backgrounds, but that sort of thing should be used sparingly, like when the camera is pointing up at the sky. PAGE 13: This page is obviously meant to be a single panel, so all that really needs doing is to make sure the overall aspect ratio is correct. 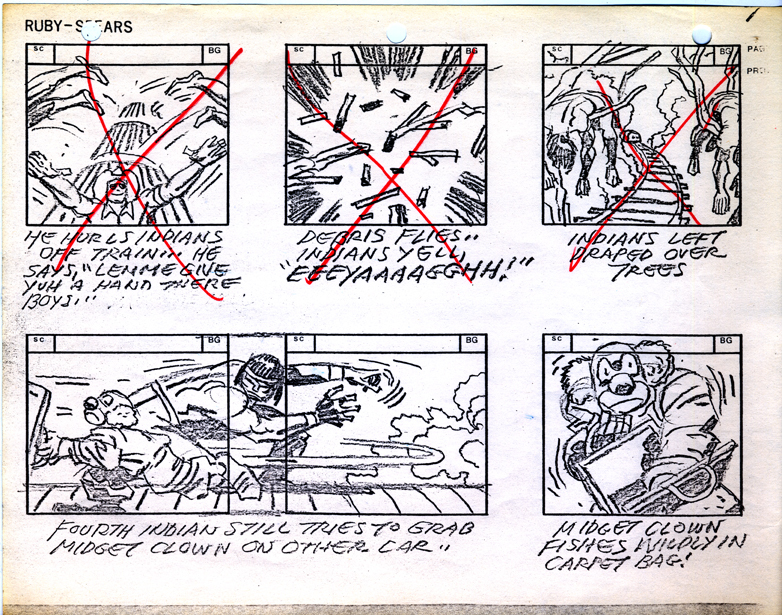 The red Sharpie “x” across the page would seem to indicate that the whole thing was cut, but from what? 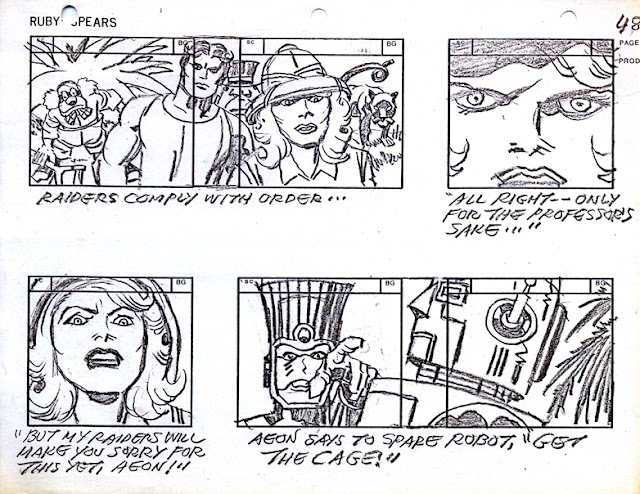 There was never a pilot made from this storyboard, as far as I know. I would specify in the staging directions that the water and flames need to be animating, maybe draw out a 3 pose cycle for those two elements. PAGE 30: Again with the artwork bleeding out of the image area into the book-keeping area. Knock it off, Jack! Also, is panel one and two a pan? If so, which direction are we panning? 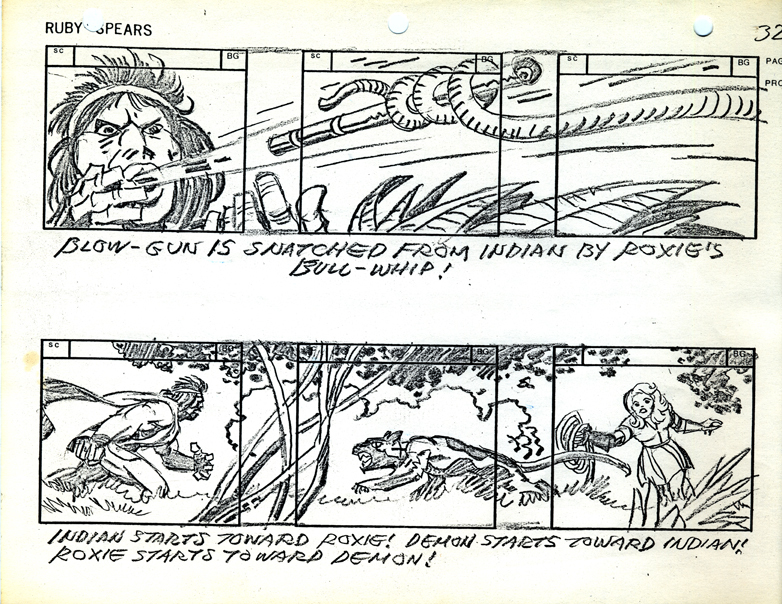 If it’s not a pan, then Xerox it down and redraw it to fit in one panel. Give me at least two acting poses on Demon in both panels one and three. Panels three and four won’t work if the bookkeeping part of the image is erased, so they need to be expanded out to either side. Screen direction on Demon flops for no reason between panels one and three, please fix. PAGE 31: God, this is too painful. 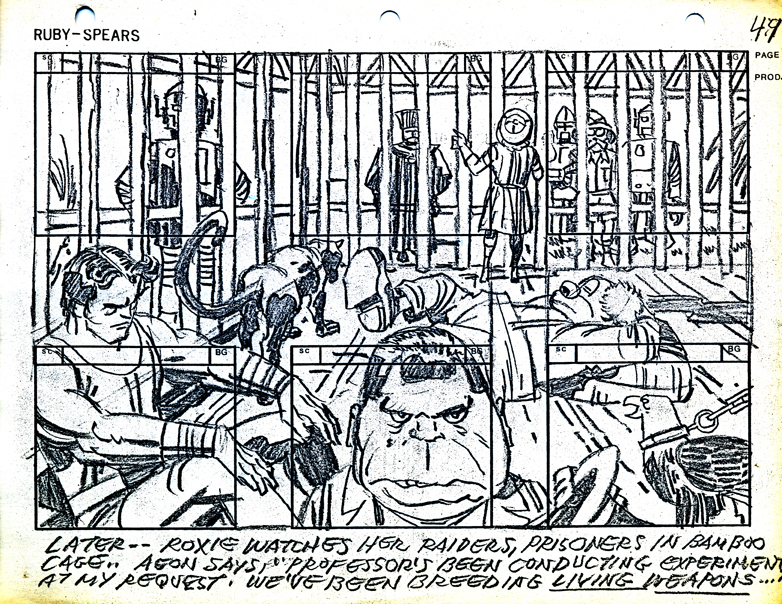 It reminds me of what Bruce Timm said about not wanting to hire his heroes (as in Jack Kirby and Alex Toth): he didn’t want to be in the position of humiliating them by forcing endless changes upon them. 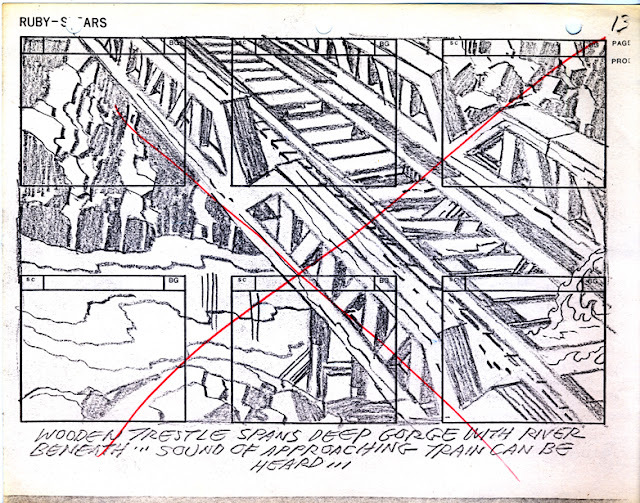 I can only imagine that John Dorman was looking for excuses to give Kirby work and accepting the results as inspiration, not something useable in and of itself. Basically, what we have here is a comicbook pretending to be a storyboard. To work as the latter it would have to be adapted by another artist, who would end up having to put more man-hours into it than Kirby did in the first place. It would be a fun job, though. 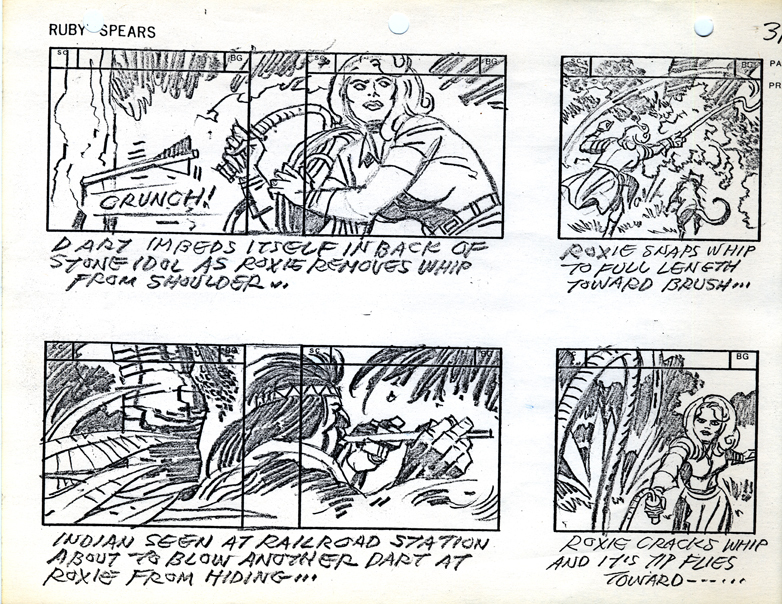 My director, the head of the Ruby-Spears story board unit, John Dorman, was also (I think, could be wrong, fact check me on this) head of the development department during the down time between seasons, and I’m hypothisize that this board was a pitch tool to try and sell “Roxie’s Raiders” as a Saturday Morning TV Series, like the recently cancelled “Thundarr”. 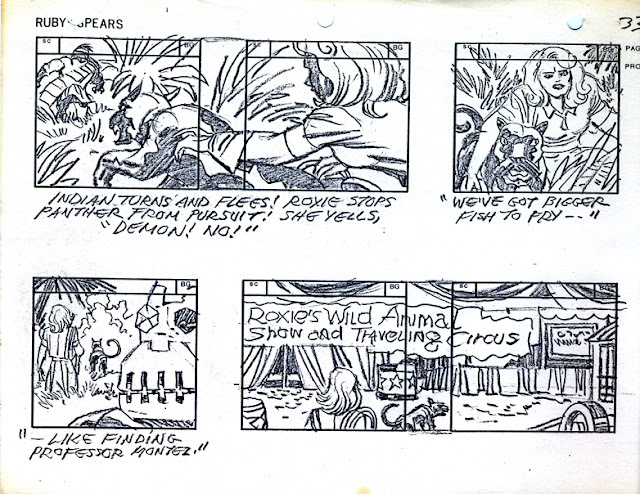 There were piles of recently completed presentation pieces from failed pitches littering the studio, done by Jack, Doug Wildey, Gil Kane, Alfred Alcala (the inker of choice). 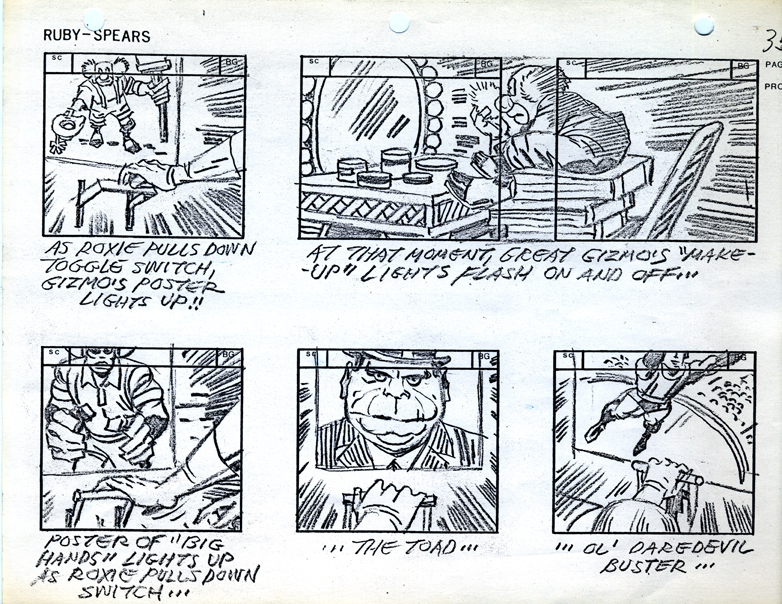 These took the forms of large marker comps, storyboards, and Kirby comic book pages the storyboard crew (fanboys all) indulged themselves by inking during the fallow fall/winter period between seasons. 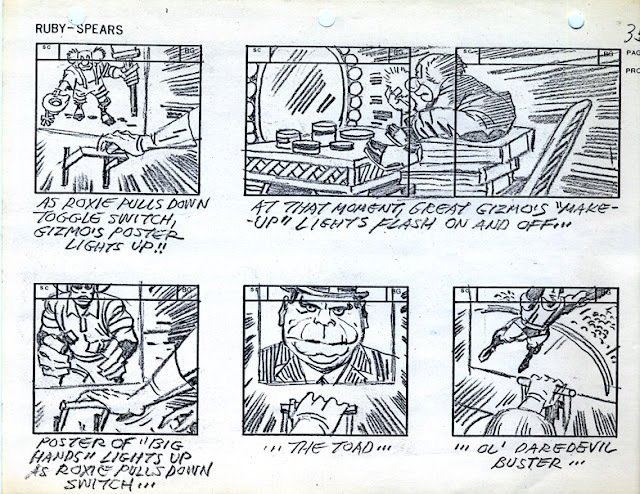 I lasted slightly less than two months as a staff storyboard artist at Ruby-Spears. It was one of the most intense periods of my entire life: It was my first job in Animation, and I was working with amazingly talented people. 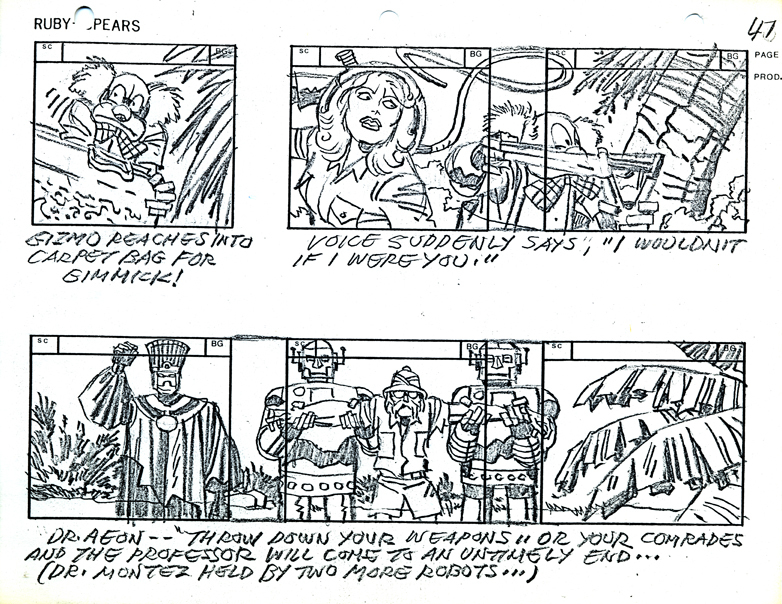 Jim Woodring, creator of the “Jim” series; Thom Enriquez, later to be a key concept stylist on Disney Features such as “Mulan”, John Dorman did boards (along with Howard Chaykin) for the “Tarna” sequence of the Heavy Metal movie and later directed the “Blackwater” series for Hanna Barbera. 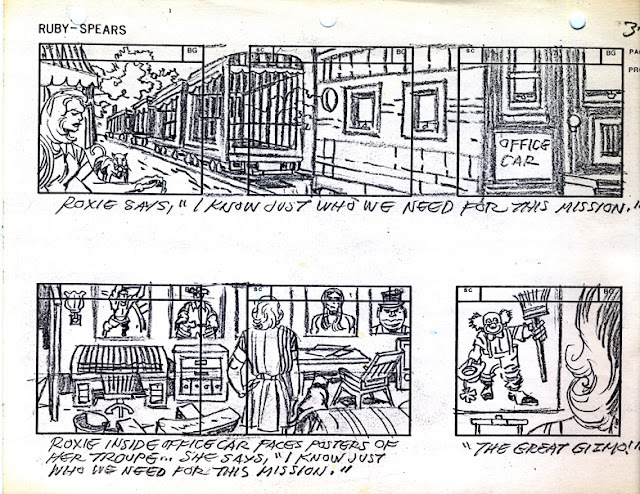 My young mind was blown by the close proximity to so many artist I’d never heard of, who had no interest in the poverty row wages of laboring in the comix industry.